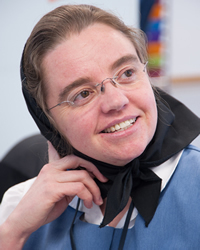 Originating in the Austrian province of Tyrol, the Hutterite people are an ethno-religious people group that is a communal branch of Anabaptists who, like the Amish and Mennonites, trace their roots to the Radical Reformation of the 16th century. Since the death of their namesake Jakob Hutter in 1536, the beliefs of the Hutterites, especially living in a community of goods and absolute pacifism, have resulted in hundreds of years of diaspora in many countries. Nearly extinct by the 18th and 19th centuries, the Hutterites found a new home in North America. Hutterite communes, called "colonies" (leut), are all rural; many depend largely on farming or ranching, depending on their locale for their income. The colony is virtually self-sufficient as far as contracting outside labor, constructing its own buildings, doing its own maintenance and repair on equipment, making its own clothes, etc. This has changed in recent years and colonies have started to depend a little more on outside sources for food, clothing, and other goods. Three subgroups of Hutterites exist in North America: (1) Schmiedeleut, (2) Darius, and (3) Lehrer. All Schmiedeleut colonies are situated in central North America mostly in the province of Manitoba and in South Dakota. There are a handful of colonies in North Dakota and Minnesota. The Darius and Lehrer -leut are situated in western North America, mostly in Saskatchewan, Alberta, and Montana with a sprinkling of colonies in BC, Washington and Oregon. Over 460 colonies exist in North America. See Map of Hutterite Colonies. To learn more, see the Hutterites of Montana and Hutterites.org. Pray God will watch over the Hutterites, instilling a heart that is fervent for a personal relationship with Jesus Christ. Pray God will protect Hutterites from persecution and ridicule.